Convert video to iPod format. Is there a better alternative to YakaMoov? Is YakaMoov really the best app in Video category? Will YakaMoov work good on macOS 10.13.4? 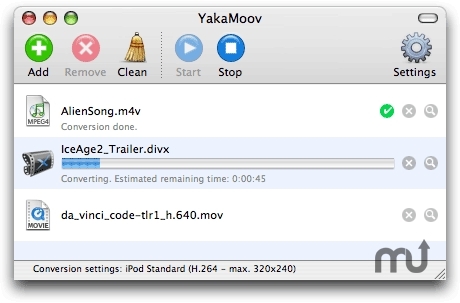 YakaMoov converts video into the proper format for your video iPod. YakaMoov has been designed to be really easy to use, with no complex configuration. Its main features are: a list of movies to be converted, 3 standard compression settings, non blocking interface even when a conversion is running, optimization of the final resolution of the movies ensuring the best quality on TV while preserving the original aspect ratio, conversion of all movie formats supported by QuickTime, including conversion of the video and audio of MPEG movies. Mac OS X 10.3.9 or later, QuickTime 7.1.3 or later, iPod video. YakaMoov needs a rating. Be the first to rate this app and get the discussion started!